With global warming on its peak, the beloved Earth is transforming towards a large-scale change to better environmental technologies, which include the use of electric cars and solar power for electricity. However, advancements are yet to be made in the home sector, with very little technology being used in home chores nowadays. To address this matter, a Swedish company, Scandinavian Water Technologies, also known as Swatab, has invented a filter system that helps to clean clothes without any detergent, and only requires cold water. The idea of the patented filter system was discovered three years ago on a small-town farm in Sweden’s southern area, where entrepreneur Per Hansson and his wife Katarina Klöfverskjöld operated their painting company. Hansson revealed that the pair had purchased a system of cleaning building fronts in an environmentally-friendly way. Upon realizing that the method was very efficient on removing algae and dirt, Hansson realized that the same idea could be applied on washing machines. With a brilliant understanding of molecules and chemistry, Hansson implemented this idea, and two years later he and his wife have now received a Europe-wide patent for their unique water filtration method. Hansson further explained that with water being highly soluble, it can even clean blood stains on your clothes with just cold water. Hansson also revealed that the filter system makes the tap water pure of any salts and contaminants by de-ionizing it. As a result, this super clean water is not in a chemical state, and when the water will be rushed through the clothes, it will attach itself to stains and dirt and thus absorb them. With this, there is no need left for detergents and warm water to clean laundry. Swatab’s filter system, which is named Diro, is a closet-sized module, that is situated between the water pipes and the washing machine. Diro has passed all extensive testing, which have been done by various Swedish research institutes as well as the European Union’s research center in Spain. Hansson proudly exclaimed that the tests showed that his filter system had passed all requirements. The cleansing effect made by the system is according to the EU-standards, and are equivalent with those standards that usually apply on tests that involve detergents to clean laundry. Now Swatab’s next goal is to prove itself as a money and emission-saving way to other businesses and consumers. 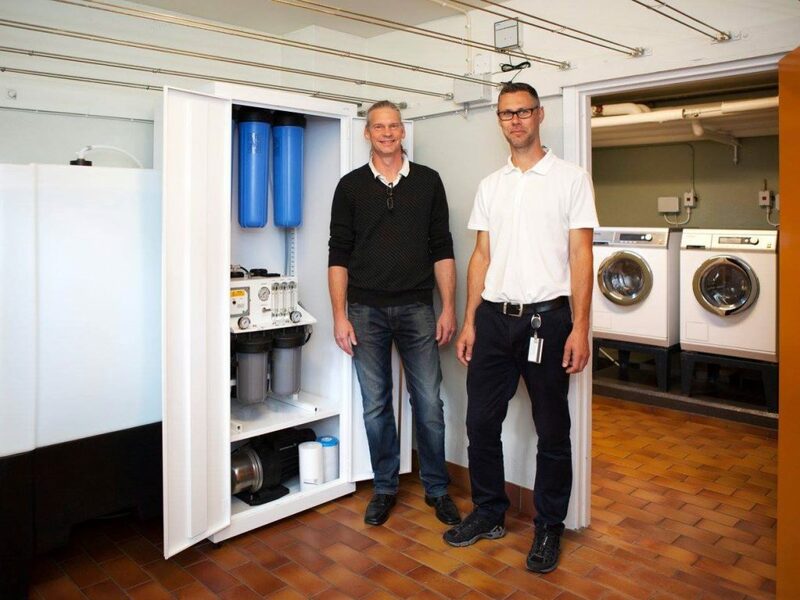 Hansson also revealed that his filter system saved one kg of carbon emissions on every 5 kilograms of laundry, which was found after tests were carried out last year in Malmö. With the company gathering interest from major companies in the U.K, it is set for its first foreign expansion outside Sweden. Nevertheless, Hansson’s long-term wish is to get his patented Diro into normal use at households, and he and his wife are now developing a solution, that will be launched next year, which will be made for the consumer markets. Moreover, the annual Cleantech Forum included Swatab as one of the six Nordic companies which were acknowledged as a WWF “Climate Solver” – a title that is earned by enterprises who ensure a sustainable economy without any harmful emissions.